Silver has become my favorite metal. Many believe that it was old fashioned. To surprise you all old silver jewelry is in demand and in fashion these days. So many websites, jewelers are selling silver jewelry. Silver comes in a variety of styles and textures. Best thing about silver is that it works well with most colors. Imagine in your head combination of silver-pink, silver-red, silver-blue, silver-maroon and so on. Silver jewelry is highly polished and reflects light beautifully. In ancient times Royal class was significant about the designs of jewelry even for their elephants, horses as well. Not all but some pieces were designed using silver. One can explore Salarjung Museum of Hyderabad for jewelry made for animals at that time. 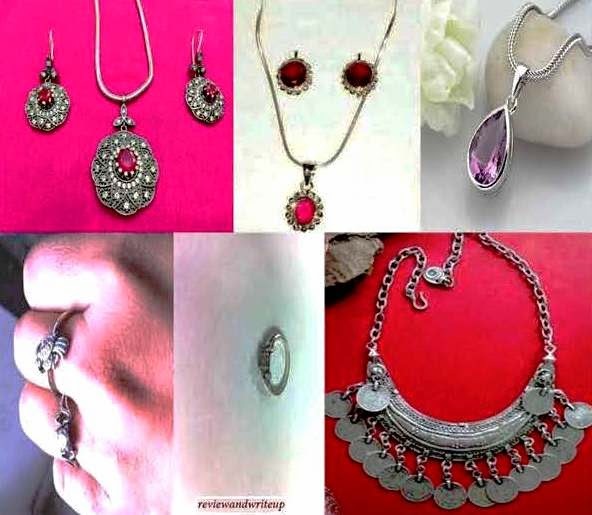 Silver jewelry is famous all over India especially in the states like Rajasthan, Gujrat, Madhya Pradesh, and Himachal Pradesh. Basic Element – Silver is called as cold metal. That’s why if you will observe women and men of Rajasthan, Gujrat areas wear heavy silver anklets, toe rings, necklaces, rings, bangles. It’s often said that most heat is transferred in our body through feet. Silver keeps our feet cool. That’s why even today everywhere in India women wear silver anklets and silver toe rings only. Spiritual – It’s believed that silver destroys negative energy. Silver is closely associated with moon. Merely wearing a silver ring makes a person calmer. I have myself experienced the difference when I started wearing silver ring. You can say that it could be psychologically as well. But it’s the matter of belief. Medically – Silver has been known to enhance the production of hormones and regulate the function of glands. Designs – Silver jewelry comes in a variety of designs. An artisan puts similar hard work as he will do for gold. In fact making charges for silver jewelry are similar to that of gold. Guys can also wear a plain silver round band in their hands. It will look cool. Also you can gift lovely ladies in your life a silver pair of earrings, set, ring. It will be light on your pocket as well. Try something different in the last quarter of the year. One of the main drawbacks to silver jewelry is that it loses its shine due to reaction with the air. But now a days silver polish and other remedies have been created which keeps it looking at its best. Girls you can add one or two nice silver sets in your wardrobe and can wear on different occasions. Trust me it looks trendy and cool. Lot of designs goes well with western as well and Indian attire. Let me know what you think of this writeup.